The Internet Chamber of Commerce presents Carpet in Gaithersburg, Maryland. Click on a company name for full contact, product and service details. For more than 20 years, Carpet 4 Less has made our clients and their homes our top priority. Whether it’s a brand new build or an in-depth home remodel, we know you’ve got a vision, a budget, and a timeline, and we stick to all three. Through our hard work and attention to detail, we surpass our client expectations every time. From tile to hardwood to vinyl, we can install them all. As your complete solution, we transport the materials to your property and install them with excellence while protecting the rest of your home. When you choose Carpet 4 Less, you get a dynamic team who carefully considers your property to ensure you only pay for what you need. We let you set the parameters and we stay within them, using our years of experience to make incredible results possible at an affordable price. We want you to be proud of the result. We want to enhance the value of your home. We want to protect your interests. Carpets 4 Less has served Gaithersburg since 2001, bringing previous experience and taking it to the next level every year. Thanks to decades of experience, we’ve gained the ability to handle any type of flooring with lasting excellence. Contact us for your consultation and quote today. Your business’s floor is the toughest member of your team. It puts up with heavy traffic, spills, scrapes, and general wear and tear. However, it isn’t invincible. At Carpet 4 Less, we’re on a mission to make it convenient, affordable, and even fun to transform your business with new flooring. As experts with more than 20 years of experience, we bring a work ethic and commitment to excellence that you won’t find anywhere else. We’ve all seen how worn-out flooring can bring a whole room down — no matter how clean or well-put together the room may be. If you see this happening in your business, we are here to help. We understand that flooring replacements may seem expensive, daunting, and inconvenient. After all, shutting down operations and clearing out rooms can be a big hiccup in your business plan. That is why we put your needs first. We’ll customize our turnkey solutions to you, working over weekends or evenings to get the job done outside of business hours. We’ll honor your budget and timeline to give you outstanding results without breaking the bank or stopping your operations in their tracks. We won’t leave until you’re completely satisfied with our installation. As business owners ourselves, we understand the roller coaster you’re riding in your own business. We want to bring you peace of mind, confidence in your business’s appearance, and relief when it comes to your budget. Contact us for a quote and let’s partner up to give your business a new lease on life! From the warm glow of redwood to the classic texture of oak, hardwood flooring is still one of the most beautiful options out there. At Carpet 4 Less, there’s nothing we love more than working with our clients to find the perfect material and finish. Thanks to our decades of experience, we have the skills to stay within your budget and install each piece of flooring with excellence that will stand the test of time. We are your complete wood flooring solution in Gaithersburg! Any type of flooring is a major investment, and wood flooring tends to stay near the top when it comes to expense. When you choose us, our team will do the heavy lifting, including finding a beautiful wood that fulfills your vision and budget. We’ll take the time to make sure you’re getting exactly what you need, and once everything is good to go, we’ll deliver the materials to your property and install them ourselves. We’ve installed wood floors for years so we know what works and what doesn’t. We’ll deliver workmanship that will make you proud! Floors may be the most humble part of any room, but that doesn’t mean they can’t bring stunning beauty to your home or business. Turn to the team who will put your interests first, sticking to your vision, budget, and timeline. Contact us for a quote today! When it comes to modern flooring solutions, laminate and vinyl are the clear champions. Not only tough and long-lasting, they are also completely customizable. They can deliver the look of hardwood, stone, tile, and beyond at a fraction of the cost. At Carpet 4 Less, we’re proud to make it easy for Gaithersburg home and business owners to transform their floors while saving money. Our experience with these cutting-edge materials means we can install your flooring with excellence that will last for years to come. Laminate and vinyl flooring are often lumped together, but they have differences that are important to consider. When you work with us, we’ll walk you through the differences and which type of flooring will meet your needs. For instance, not all laminate flooring is waterproof. Our waterproof vinyl flooring can expand and contract, which makes it ideal for high-traffic areas or places like kitchens, where spills happen every so often. By understanding exactly what your floor will need to handle, you can choose the material that will last the longest. We’re happy to help! In addition to matching you with the right flooring material, we also handle installation. Our expert team will work with your schedule to make sure the installation is as convenient as possible. Learn more about our services and get a quote today. Guaranteed Low Prices & Free Shipping! Shop the Web's largest and best priced selection of logo mats, entrance mats, anti-fatigue mats, and more! Keep facilities looking fresh with "hassle free" matting rental, rotation, and cleaning services. Available to businesses in the Washington D.C. Metro Area. 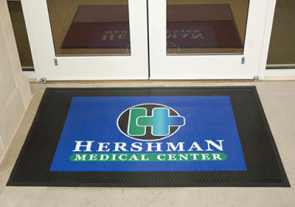 Think your business logo is too colorful or complex to be printed on your entrance mats? Think again. Introducing the Graphic Impressions, now available on Eaglemat.com. Graphic Impressions mats are printed using a state of the art digital printing process that allows for a nearly limitless combination of vibrant colors, 3D imaging, shading, and a whole lot more. 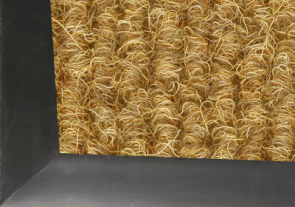 The core of the mat is made with tough, static dissipative nylon yard to provide exceptional moisture absorption. At 3/8” thick, this mat also provides basic protection for tile, hardwood, and granite floors. And with a 100% commercial-grade rubber backing, the Graphic Impressions logo mat stays in place throughout the day to ensure spills, slips, and falls are prevented. Looking for a high quality logo mat that won’t fade or wear thin? 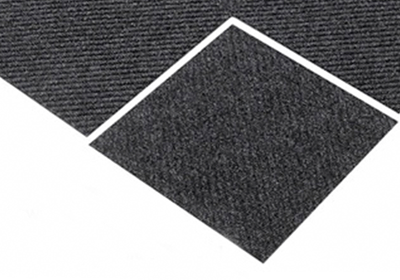 Say hello to the Supreme Carpet Logo Mat, the safety matting industry’s highest quality carpet logo mat. Now featuring MasterWeave tufted technology for extra texture, resiliency, and cleaning ability. Made with the thickest nylon yarn of any mat in its class, the Supreme Carpet Logo Mat provides superior moisture and debris retention. With added Perma-Dye treatment and Stain Stopper technology, the fibers of this mat are designed to last without becoming faded or stained over time. 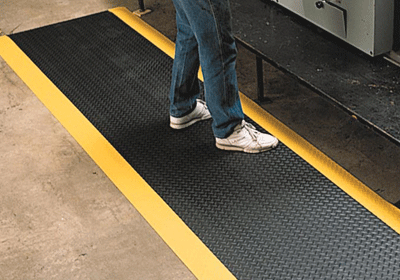 This mat is an anti-static mat, meaning visitors can walk from end to end without receiving a charge from ESD. Perhaps you’ve noticed one of these waffle-patterned logo mats at the entrance to an upscale hotel, bank, or commercial business facility. The Waterhog is easily recognized for its uniquely textured surface, an asset that aggressively cleans and contains moisture and debris from shoes. The Waterhog Logo Mat uses a computer-assisted “logo inlay process” to cut and embed your company’s logo within the surface of the mat with unmatched precision. At 1/4” thick, this mat is thick enough to provide superior protection while maintaining a low profile that is not easily caught under doors. Order on Eaglemat.com to receive complimentary image upload and proofing. Industry experts recognize Berber as one of the toughest and most popular commercial matting materials on the market. 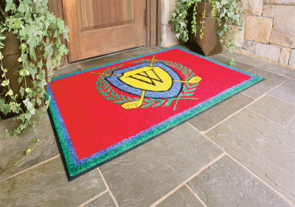 Now, customize a long-lasting berber entrance mat with your company’s logo, slogan, or crest to create a lasting impression with customers and guests. 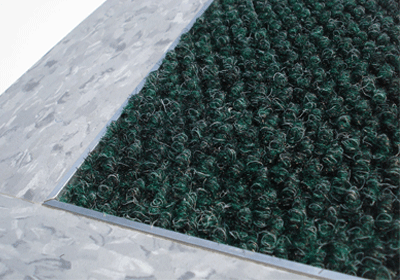 These mats are designed exclusively to handle the wear and tear of highly trafficked areas. Popular among malls, transportation hubs, and high traffic commercial buildings, Berber Supreme Logo Mats are the perfect choice for installations that require a matting solution that is extremely tough, long lasting, and fully customizable with logos and a wide array of colors. The Berber Supreme Logo Mat also features a high profile vinyl edge to improve visibility, stability, and debris control. Who said tough outdoor mats can’t look good, too? 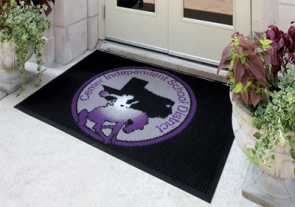 Introducing the Rubber Scraper Logo Mat, the ideal solution for indoor/outdoor entrance areas that need superior moisture and debris control. 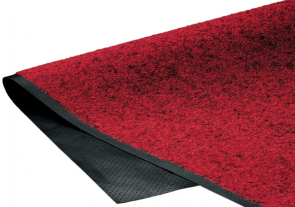 Rubber Scraper Mats are known to keep the elements at bay, squeegeeing dirt and grime from the under soles of shoes before guests enter the building. 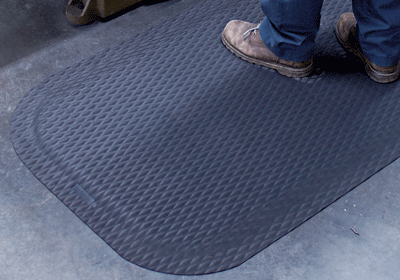 Made using 100% nitrile rubber, these commercial-grade safety mats are designed to endure years of abuse without cracking or curling. And at 3/8” thick, these scraper mats are often used to prevent chips, scrapes, and scratches to underlying floor surfaces. 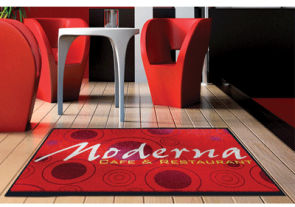 Customize this mat with your company’s logo, without compromising performance or cleaning ability. 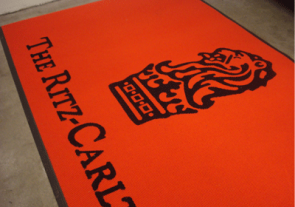 You don’t get to be the most popular commercial entrance mat without having a few indispensable qualities. High-twist, heat-set carpet surface is one. Commercial-grade rubber backing is another. Put them together, and you get the core of the Premier Carpet Mat, an affordable matting option that doesn’t skimp on performance. With widths starting at 7’ and going all the way up to 12’, the Premier Carpet Mat is available in a wide array of sizes to satisfy the needs of almost any commercial facility. And with more than 35 eye-catching colors to choose from, this entrance mat can make a bold statement— or blend in with existing decor. The choice is yours. Designed for use in light to moderate traffic areas, this basic entrance mat is a must-have for any business that opens its doors to the public. Don’t let the name fool you. They might be plush, but that doesn’t mean they aren’t tough. 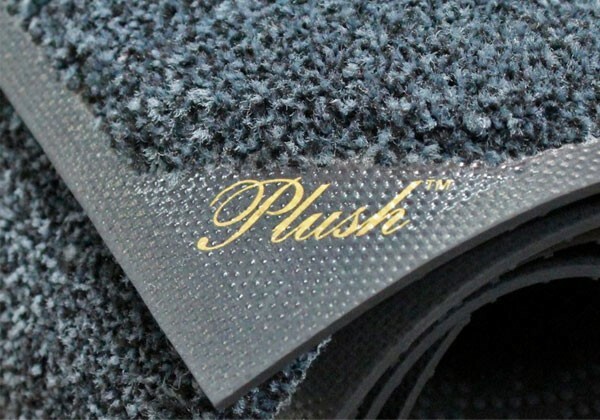 In fact, our Plush Carpet Mats are made with a heavier carpet capable of trapping more than 45% more liquids and debris compared to other leading carpet mats. Simple and functional, Plush Carpet Mats are available in 8 standard colors, ranging from Black to Red Pepper. Best of all, these carpet entrance mats are completely launderable. Whether enlisting the cleaning services of a professional or washing the mats yourself, you can rest assured that these carpet mats can withstand a deep cleaning that eliminates harmful bacteria, without causing damage to the mat itself. Style it: Choose from square or rounded corners to complete the look of your new dryer, safer entryway. 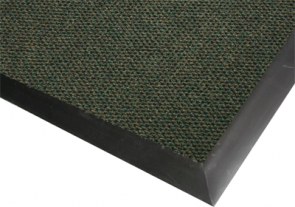 Say hello to the commercial matting and safety industry’s most popular mat and runner for busy areas. Whether lining a vestibule or extending through a hallway, the Berber Supreme provides superior floor protection and slip prevention. 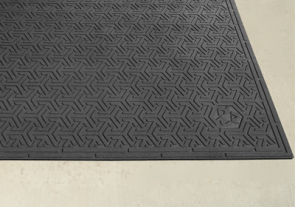 This mat features a highly textured, very unique design that is built to scrape and contain both dry and liquid debris. The staggered nub pattern is undoubtedly distinct, made using a combination of 3-coarse fibers for which Berber is best known. Berber Supreme also features Ultra Violet Stabilizers to minimize damage and color fading from the sun. Choose from dozens of vivid colors, ranging from Autumn Red to Zinc. Looking for an alternative to the Cocoa Mat? Introducing the Berber Supreme Brush, Berber’s built-tough response to the cocoa mats. Using a high quality combination of polypropylene fibers, the Berber Supreme Brush features a thickly woven surface texture that is ideal for heavily trafficked commercial areas. A woven fabric extends across the entire surface, just below the surface of the mat, providing additional debris control throughout the day. 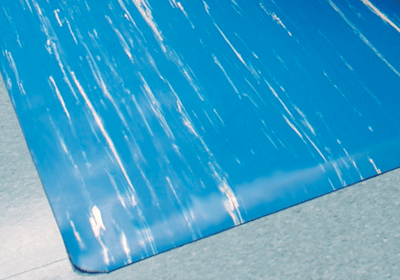 For customizable protection, select a thickness that is right for your facility: 3/8”, 1/2” or 5/8”. Now available in 14 distinct colors with black or brown edging. What’s the secret to this eco mat’s superior cleaning ability? It starts with the surface— the Rubber Scraper ECO Mat’s multi-directional textured surface digs deeper into the soles of shoes than other comparable entrance mats, aggressively scraping away at moisture and debris. Best of all, the purchase of this mat has far-reaching benefits beyond the walls of your brick and mortar store. Made with 95% post consumer recycled tires, this eco-friendly scraper mat makes good use of existing materials, without compromising style or function. This mat also features a recycling symbol on the front surface to spread awareness for recycling and sustainability. Ideal for both indoor and outdoor use, the Rubber Scraper ECO Mat is ideal in environments where mud, dirt, rain, and grime must be kept away from facility interiors. Sometimes, a floor mat or recessed tile simply will not cut it. The Recessed Grill Pedimat is designed to protect against extreme weather, heavy foot traffic, or a combination of both. Popular among airports, train stations, commercial office buildings, and just about every facility with a heavily trafficked vestibule, the Pedimat provides superior protection against the accumulation of melted snow/ice, rock salt, rain, moisture, and other debris. Contaminents fall between the grooves of the surface and are collected in the underlying recessed compartment. Later, the surface of the Pedimat is easily rolled back so the underlying compartment can be shop-vacuumed clean. Surface of the Pedimat is heavy load bearing yet easy to roll back, and it features noise canceling cushions and insert options to reduce the noise of heavy foot traffic, wheeled carts, and crowds. Are you in need of a recessed grill mat, but concerned that heavy wheeled traffic might damage the recessed system? If so, the Peditred is for you. At 3/4” thickness, the Recessed Grill Peditred is built to endure up to 1,000 lbs of rolling load weight— the highest in the industry. But all that strength does not mean an unsightly “commercial” construction, however. The Peditred features a low-profile design that matches exceptionally well with most interior decor schemes. Customize the look of the Peditred with more than 20 eye-catching carpet inserts, 6 unique vinyl colors, and an additional 6 options for abrasive tape highlights. Like the Pedimat, this recessed grill system allows for heavy amounts of dirt, debris, and liquids to fall beneath the surface and into the recessed compartment below. At regular intervals, simply instruct maintenance personnel to roll back to surface to clean the underlying recess with an industrial-strength “shop vac.” With the Peditred, studies show up to 60% of all incoming dirt, debris, and contaminants can be stopped at the door. Rising more than a full inch in height, the Recessed Grill Pedigrid is the tallest in its class. This provides ample space below the surface to trap incoming liquids, dirt, and other contaminants. Though tall, the surface of this recessed grill mat lies flush with the walking surface to present a minimal tripping hazard. Stop more than 50% of all incoming debris with the Pedigrid, and take a proactive step toward a cleaner facility, healthier employees, and a more sustainable business practice. Maintain a clean and professional appearance by easily customizing the look of the Pedigrid with over 25 different carpet or vinyl inserts. The Berber Supreme Recessed Mat is ideal for use in the vestibules of commercial buildings, banks, universities, elementary schools, post offices, and other buildings that experience a moderate-to-heavy degree of foot traffic. Featuring the unique high-low Berber carpeting texture, this recessed matting option delivers a superior clean to each shoe that passes along the surface. Measuring 7/16” thick, this recessed mat also provides a thick layer of protection to insulate underlying concrete from damage. 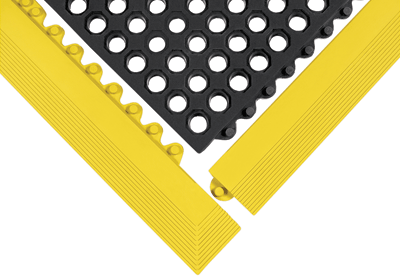 These mats are designed to fill recesses that measure from 3/8” to 1/2” (varies by color option). Improve facility cleanliness and safety with these mats, now available in more than 45 vivid colors! Made using the “Berber” signature 3-coarse combination yarn, these recessed modular tiles are ideal for heavily trafficked entryways, vestibules, elevator lobbies, employee areas, and other heavily trafficked facility throughways. The Berber high-low surface texture ensures aggressive cleaning that quickly dislodges debris, mops up moisture, and holds contaminants below the walking surface. Available in 8 dark, dirt-hiding colors, ranging from Spruce to Midnight Blue and Charcoal. Available in both 3/8” and 7/16” thicknesses. 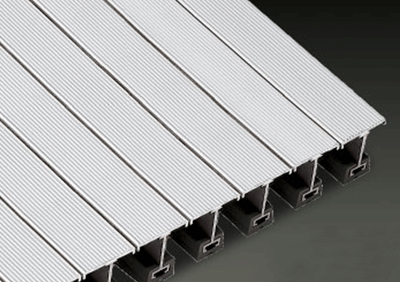 Made available for purchase in cases of 16 units, each tile fits together to create a seamless application that lies flush with the walking surface. One of the most popular non-porous ergonomic mats on the market! The Marble Top Anti-Fatigue Mat is ideal for environments where standing and working causes strain in the legs and lower back. Install these mats to give employees a softer, more ergonomic standing surface that keeps things comfortable all day long. Anti-microbial surface reduces the spread of harmful bacteria, providing an additional benefit that keeps workplaces clean. If you are looking for a mat that is both ergonomic and eco-friendly, look no further than the SMART Top Anti-Fatigue Mat. 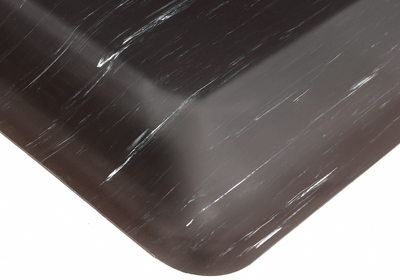 This product is similar to better-known models like the Marble Top, but made with 100% recycled urethane composite. 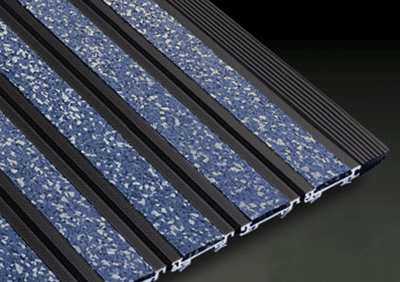 Reduce your carbon footprint and demonstrate good environmental stewardship with these mats, each of which is built 5x stronger than the typical “sponge” mat for standing areas. Improve employee moral and productivity with the Ultra Soft Diamond Plate anti-fatigue mat. True to its name, the Ultra Soft features a highly compressible surface that stimulates muscle fibers and improves blood flow. This reduces cramping and strain while standing for long hours, giving everyone something to smile about. Comes with a diamond plate surface for even better traction and dirt/grim control. Hog Heaven is an industry standard when it comes to ergonomic anti-fatigue mats for the workplace. Our Hog Heaven mats do not disappoint, featuring a tough construction made of 100% commercial-grade Nitrile rubber. With two heavy-duty thickness options (5/8 and 7/8”), Hog Heavens come ready to handle the needs of almost any commercial or industrial workspace. Now available with 4 distinctive colors for enhanced visibility: Green, orange, red, and yellow. Anti-Fatigue drainage tiles are ideal for wet areas where employees spend long hours on their feet. Our 24/7 Drainage Tiles feature large holes for superior liquid management, along with a heavy-duty Nitrile rubber construction that is built to endure years of punishment. 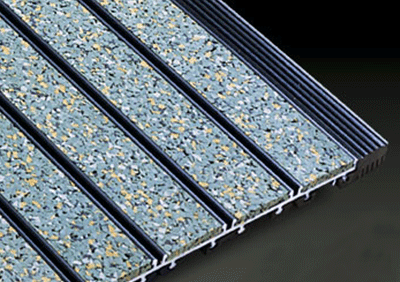 It’s no wonder these drainage tiles are our most popular product for industrial areas of all sizes. Simply place and snap together for a seamless interconnected application that effectively drains liquids, protects floors, and keeps employees comfortable.